Quite often, the painter Nesterov turned to religious topics. Here and there he did not change himself, but simply hid his feelings under this canvas. What kind of feelings are you asking? Everything is explicable: just once the artist fell in love, at first sight, like a lightning strike, like a hurricane of passions. And it was mutual. And when it all went to the wedding, he was suddenly denied. Moreover, it was not denied at a personal meeting, but a banal letter. It was a blow and impressed by this Nesterov and created this canvas. Although what’s the reason for rejecting love and the image of nuns… But he hid his feelings just like that. He hid his love under the care of the monastery. 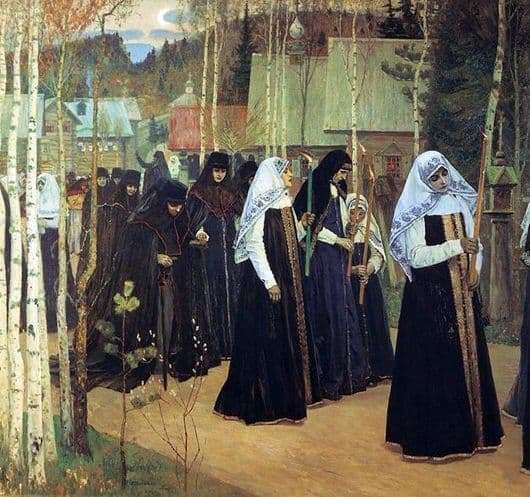 On the canvas is a procession of nuns to perform a vow. Those on whom the white headscarf is dressed are not yet nuns, but they are already at the very goal. One of the white-plate patrons is confidently leading the way and is already completely immersed in prayer, in its own sacrifice. Behind her comes another girl, but it seems that she is still all in the world, all in the passions and in the eyes there is still no submission to fate. And next to her there is a woman who has long obeyed fate and took the veil, and next to her is a girl, whom the world is not yet clear, and even here it is not accepted and meaningful by her. And behind them are the nuns of different ages, who lead under the arms of a beautiful, stately woman – this is an abbess. The plot is masterfully presented, a certain conflict between man and nature is masterfully presented. Look here, how beautiful spring nature is opposed to the mood of people. But at the same time it is still a requiem, an artistic requiem for a failed artist’s love. Nesterov found it necessary to pour out his sufferings in precisely this way, and for that we are grateful to him. Because they got a true masterpiece of Russian school of painting, which has no equal in the world. And by the power of perception it is completely priceless, because only a Russian can understand a Russian: his despair, his grief, his love.